all photos of La Rumorosa by E. Harel Copyright © 2005 All rights reserved. McCaleb’s La Rumorosa is set to music by Mexican composer Fernando Corona. 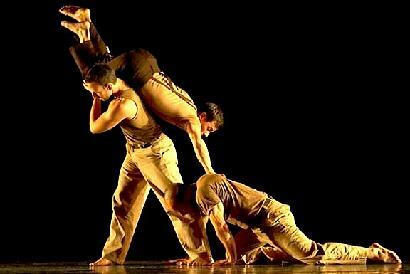 It is a haunting and powerful dance inspired by the rugged landscape between the Mexican border towns of Tecate and Mexicali, where the Sierra Juarez drops 4,000 feet into the Baja California desert. La Rumorosa (The Whispering One) refers to the winds that blow through the canyons. Since the ancient days when native tribes left paintings on its rocks and boulders, La Rumorosa has been an avenue of perilous journeys. It is a desolate and dangerous place where dozens of wrecked autos rust in the ravines below the hairpin curves along the road. And it is the hazardous route where hundreds of migrants have died in the freezing mountains and scorching desert trying to cross into California. 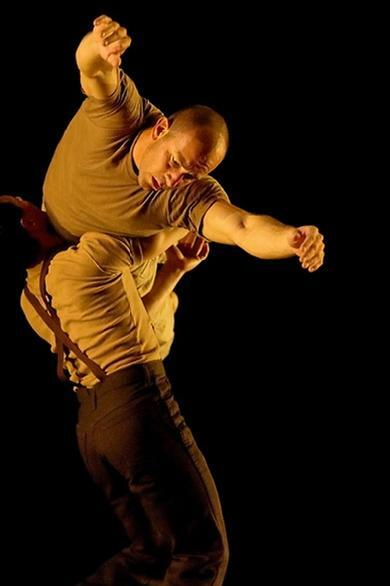 The creation of La Rumorosa was supported by the National Endowment for the Arts Creativity Grant and the James Irvine Foundation’s DanceMaker Grant. In addition to the performers, company dancers Sarah Kaye, Ali Fischer, and Troy Sellers took part in McCaleb’s creative process to make La Rumorosa.